Ernesto "Che" Guevara (Spanish pronunciation: [ˈtʃe ɣeˈβaɾa]; June 14, 1928 – October 9, 1967), commonly known as el Che or simply Che, was an Argentine Marxist revolutionary, physician, author, guerrilla leader, diplomat, and military theorist. A major figure of the Cuban Revolution, his stylized visage has become a ubiquitous countercultural symbol of rebellion and global insignia within popular culture. As a young medical student, Guevara traveled throughout South America and was radicalized by the poverty, hunger, and disease he witnessed. His burgeoning desire to help overturn what he saw as the capitalist exploitation of Latin America by the United States prompted his involvement in Guatemala's social reforms under President Jacobo Árbenz, whose eventual CIA-assisted overthrow at the behest of the United Fruit Company solidified Guevara's political ideology. Later, while living in Mexico City, he met Raúl and Fidel Castro, joined their 26th of July Movement, and sailed to Cuba aboard the yacht, Granma, with the intention of overthrowing US-backed Cuban dictator Fulgencio Batista. Guevara soon rose to prominence among the insurgents, was promoted to second-in-command, and played a pivotal role in the victorious two-year guerrilla campaign that deposed the Batista regime. Following the Cuban Revolution, Guevara performed a number of key roles in the new government. These included reviewing the appeals and firing squads for those convicted as war criminals during the revolutionary tribunals, instituting agrarian land reform as minister of industries, helping spearhead a successful nationwide literacy campaign, serving as both national bank president and instructional director for Cuba’s armed forces, and traversing the globe as a diplomat on behalf of Cuban socialism. Such positions also allowed him to play a central role in training the militia forces who repelled the Bay of Pigs Invasion and bringing the Soviet nuclear-armed ballistic missiles to Cuba which precipitated the 1962 Cuban Missile Crisis. Additionally, he was a prolific writer and diarist, composing a seminal manual on guerrilla warfare, along with a best-selling memoir about his youthful continental motorcycle journey. His experiences and studying of Marxism–Leninism led him to posit that the Third World's underdevelopment and dependence was an intrinsic result of imperialism, neocolonialism, and monopoly capitalism, with the only remedy being proletarian internationalism and world revolution. Guevara left Cuba in 1965 to foment revolution abroad, first unsuccessfully in Congo-Kinshasa and later in Bolivia, where he was captured by CIA-assisted Bolivian forces and summarily executed. Guevara remains both a revered and reviled historical figure, polarized in the collective imagination in a multitude of biographies, memoirs, essays, documentaries, songs, and films. As a result of his perceived martyrdom, poetic invocations for class struggle, and desire to create the consciousness of a "new man" driven by moral rather than material incentives, he has evolved into a quintessential icon of various leftist-inspired movements. 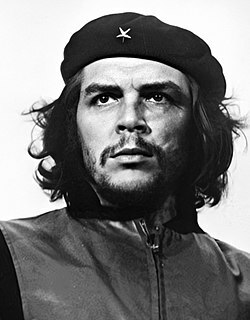 Time magazine named him one of the 100 most influential people of the 20th century, while an Alberto Korda photograph of him entitled Guerrillero Heroico (shown), was cited by the Maryland Institute College of Art as "the most famous photograph in the world". ↑ The various sound clips on this site of international Spanish speakers: Forvo.com pronounce the G in the name "Guevara" as [ɡ] or [ɣ] depending on how carefully they enunciate. When the names are spoken together, it is [ɣ]; when enunciated separately, [ɡ]. ↑ ៩,០ ៩,១ On Revolutionary Medicine Speech by Che Guevara to the Cuban Militia on August 19, 1960. "Because of the circumstances in which I traveled, first as a student and later as a doctor, I came into close contact with poverty, hunger and disease; with the inability to treat a child because of lack of money; with the stupefaction provoked by the continual hunger and punishment, to the point that a father can accept the loss of a son as an unimportant accident, as occurs often in the downtrodden classes of our American homeland. And I began to realize at that time that there were things that were almost as important to me as becoming a famous or making a significant contribution to medical science: I wanted to help those people."